This artist-in-residence studio is an amazing architectural gem located on the coast of the Netherlands. Made from shipping containers, not only does it provide an eco-friendly, practical and cozy place to stay, but it also offers up more than enough room for any artist to get down to work! 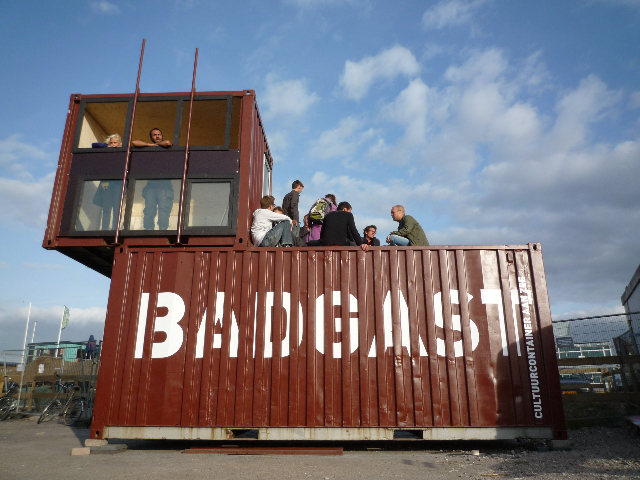 The container studio, dubbed BadGast, was designed and built by Netherlands-based recyclers extraordinaire Refunc for Satellietgroep, a cultural and arts organization. The topic of the artist in residence program is ‘The Sea’ and each month a new artist, designer, architect, or most surprisingly, a scientist, is invited to spend a month researching and working on a new ocean-related topic. BadGast, which roughly translates to Bath Guest, is a modern live/work studio, located in a unique and artistic surfers village called F.A.S.T (Free Architecture Surf Terrain) on the beach in Scheveningen near the Hauge. FAST is a new urban beach community with a strong focus on the arts, protection of the sea as well as surfing. The program for the cultural container on the sea began in September 2009 and every month a new person has come to work on a sea or bather related project, which is then presented at the end of their time. Refunc, who has built many other structures and buildings using shipping containers and reused materials, built the live/work studio container. The bottom twenty foot container serves as the resident’s art studio, which is very simply finished with untreated plywood, and the living quarters are located in a small ten foot container atop the studio, accessible through an outdoor staircase with a small deck on top. What a wonderful project ... It's inspiring to see how the surrounding environment has such a strong relationship to the structure, and impact on the creative work being done there. BadGast, which roughly translates to Bath Guest, is a live/work artist in residence studio located on the coast near the Hauge in the Netherlands. The studio was built for Satellietgroep, who provides an artist in residency program for artists, designers, architects and scientists interested in the sea. Artists spend a month in the minimal studio working on projects that relate to the sea, ocean and bathers, ultimately presenting their findings or works at the end of the month. 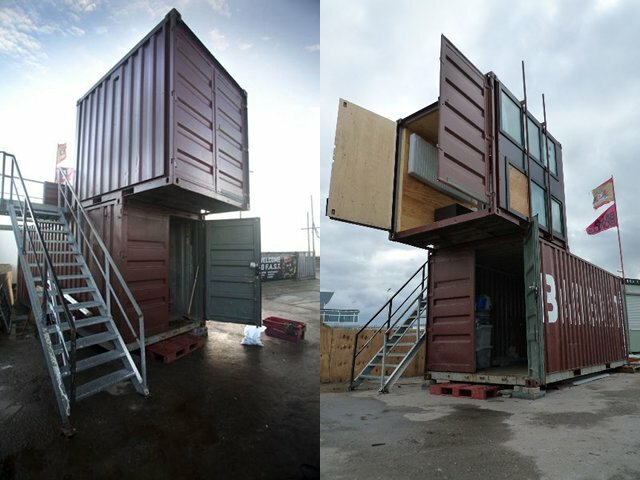 Refunc, a talented group of architectural reusers, built the container studio for Satellietgroep. The program for the cultural container on the sea began in September 2009. The studio is composed of a twenty foot container and a small ten foot container stacked on top of one another. The living quarters are located atop the structure and are accessible via external staircase with a small rooftop deck. Minimally furnished, the container studio provides exactly what is needed for a month long residency. The inside is finished with untreated plywood and includes built in storage, shelving and work space. The container studio opened back in 2009 and is located on the grounds of F.A.S.T (Free Architecture Surf Terrain) an art and surfing village located near the Hague.